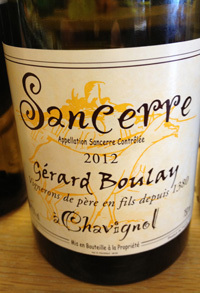 2012 Gerard Boulay, Sancerre Blanc, Chavignol, France. The Gerard Boulay wines are exotic and marvelous, especially his beautiful and full Sancerre that always seems to excite and please regardless of vintage. His wines are made with mostly natural and with strict farming practices which highlight pureness and a sense of place and soils, and this Sancerre comes from plots that rest on Silex and Clay giving a very complex array of flavors and mineral essences. Gerard Boulay also ferments and ages in neutral wood, and sees time on the lees, which adds richness, depth and texture, without hiding the wines suburb steely quality or it’s fresh acidity, Gerard is an artisan that has his craft down, these are glorious wines, wonderfully balanced and focused. The 2012 is a Sauvignon Blanc full of energy, life and quality from start to finish with a round palate of lemon/lime, peach, gooseberry and hints of grapefruit along with wet stones, brioche and melon. The mouth feel is joyous and the brisk liveliness keeps your mouth watering for another sip, the finish is long, but the crisp mineral notes and citrus burst keeps things fresh and taught, this Sancerre is well judged and extremely delightful, drink now through 2017.